Well here I am sat in my second home The Travelodge in good old Clacton-on-Sea. I call it my second home as I seem to spend a lot of time here. I get looked after very well from the staff here as a regular, they always put my extra pillows in my room prior to arrival and I always get the same room on every visit, I must put some pictures up next year, in fact they even know I am the phantom tea and coffee thief pinching stuff from the housemaids trolley, but they never moan. Well the end of the season has come for me, and after a very busy season some 70,000km and a vast assortment of tours this season, I must say I’m a wee bit tired and ready for a rest. So I have decided to have my wee rest here in Clacton before I return to the Highlands of Scotland. So what am I gonna do on the return to the Highlands I’ve been asked a lot, well I’m afraid it’s no rest for the wicked, I will have a few days off before returning to my winter job. So what is a Haggis, a question im commonly asked by tourists who want me to catch them one. I will try to explain!. I say animal, actually it’s a bird with vestigial wings – like the ostrich. plain – then they are very easy to catch – they can only run round in circles. to that other great Scottish invention, the bagpipes. itself forward, and this it can do at a very reasonable speed. swim ahead, and the youngsters follow in a line abreast. The largest known recorded haggis (caught in 1893 by a one of my ancestors at the base of Ben Nevis),and weighed 25 tons. In the water, haggis have been known to reach speeds of up to 35 knots, and therefore coupled with their amazing agility in this environment, are extremely difficult to catch, however, if the hunter can predict where the haggis will land, a good tip is to wait in hiding on the shore, because when they come out of the water, they will inevitably run round in circles to dry themselves off. This process, especially with the larger haggis, gives rise to another phenomenon – circular indentations in the ground, and again, these have been mistaken by tourists as the landing sites of UFOs. I hope this clears up some of the misconceptions about the Haggis, that rare and very beautiful beastie of the Scottish Highlands (and very tasty too). I take my winter job very serious and offer the services as a highly experienced Haggis Hunter to catch one of the wee blighter’s for you!!.. Dont worry Nikki yours will be the first to be caught. Would you like a Haggis now taking orders, but please bear in mind this is not a cheap service it will cost you an arm and a leg!. So on my return back to the highlands of Scotland I would just like to say it has been a pleasure once again to work with all my colleagues again and look forward again at christmas new year and next season to return. See all our coach holidays to Scotland. 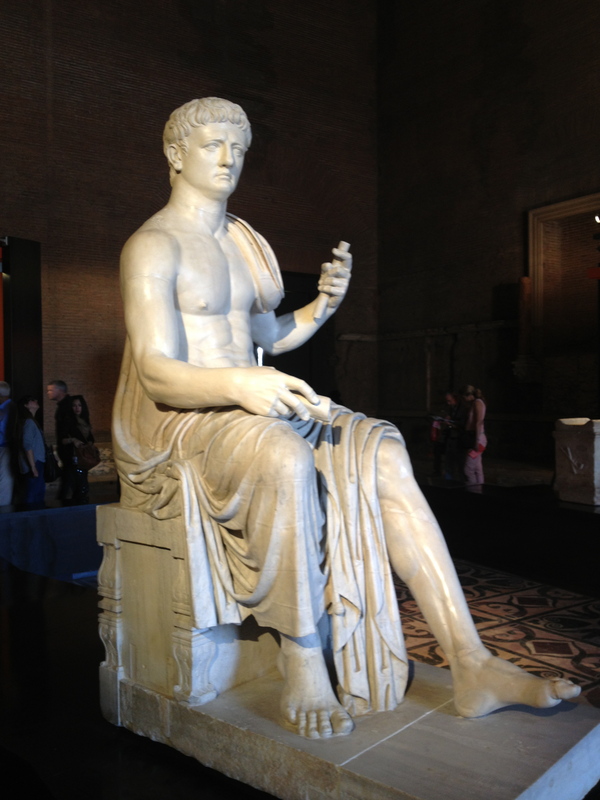 Ever since I was a child I have always been fascinated with two places, Egypt and Rome. I guess at a young age you find it hard to believe the history depicted in text books and movies could ever have been real. 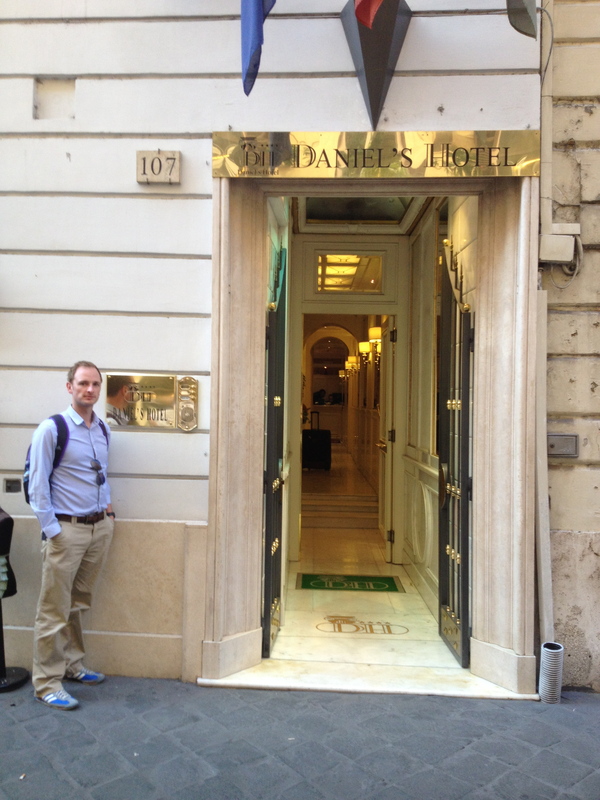 The opportunity to spend the day in Rome whilst on holiday in Italy was greeted with great expectation and apprehension. I was naturally worried that the ‘Eternal City’ wouldn’t live up to my expectations and this disappointment would crush all those images and stories of ancient Rome I had carried with me over the years. 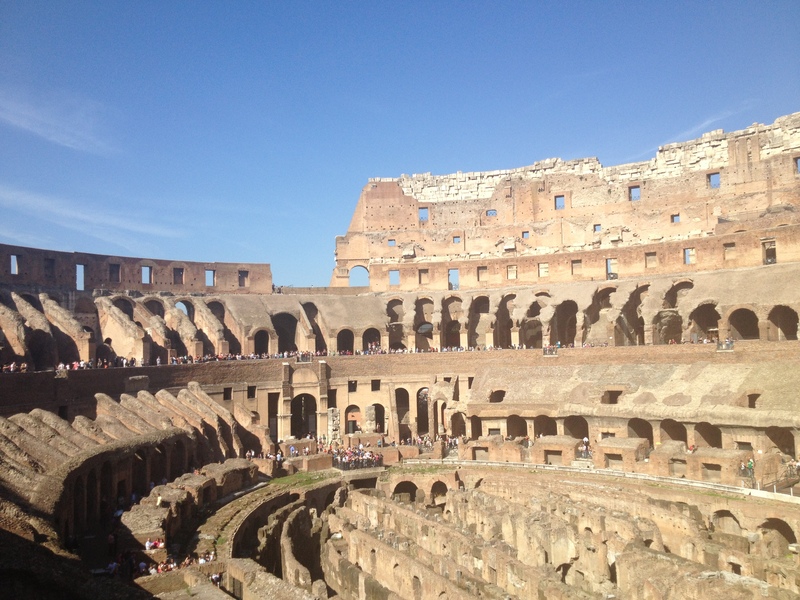 Never the less, Rome far exceeded my expectations, I wouldn’t hesitate to say it blew me away. As you approach the centre from the outskirts you immediately feel the presence of immense historical significance. The grandness of the buildings start to emerge with the countless statues depicting great political and religious figures adowning churches, temples and bridges. 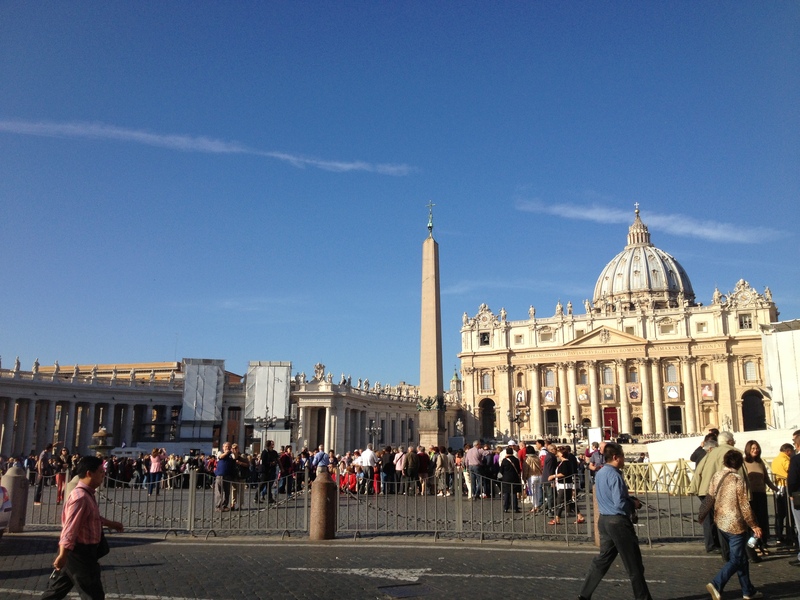 We were dropped off outside the Vatican City and the Sistine Chapel. Armed with a map, backpack, camera and lots of energy our first point of call was one that I would not miss, one that I had to see above all else, the Colosseum. It would have been about a 1hr walk to the Colosseum so we decided to share a taxi with another couple. We only had one day so I was conscious of time. Normally of course I would have jumped at the chance to walk through the city. During the taxi journey the driver pointed out important sites along the way. She asked the usually questions of where we were from and if we were enjoying Italy. She was very polite and helpful. Whilst she was talking about a building called the Wedding Cake, in the corner of my eye I caught a glimpse of the Colosseum. On approach it was everything I imagined and more. Upon exiting the taxi you can’t help but place yourself back in the heart of the Roman Empire and seeing such a structure for the first time. 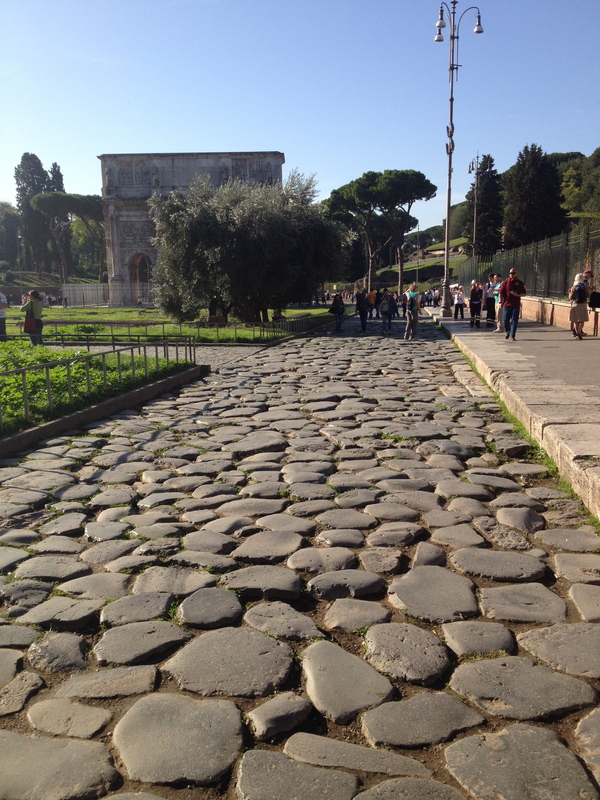 A tip off from our tour guide meant we avoided queuing at the Colosseum by visiting the Roman Forum first. 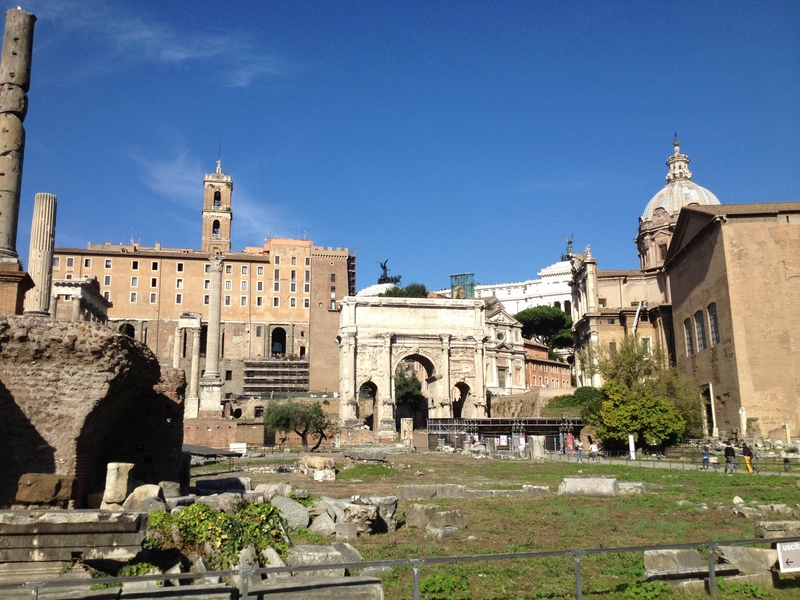 The forum was home to the most important buildings in Rome during the time of the Roman Empire. As i’m sure you can image most of it is in ruins and it is very hard to picture what it was like all those years ago. The audio guide may as well been in Italian or French as it was not helping me at all. I fought with my imagination as I walked past monuments, temples, ancient structures and statues. It seemed so peaceful, almost like the architectural and engineering feats of the Empire has been put to rest. For a few seconds at a time you could almost shut off the thousands of tourists or blend them into the surroundings as the people of Rome in its heyday. 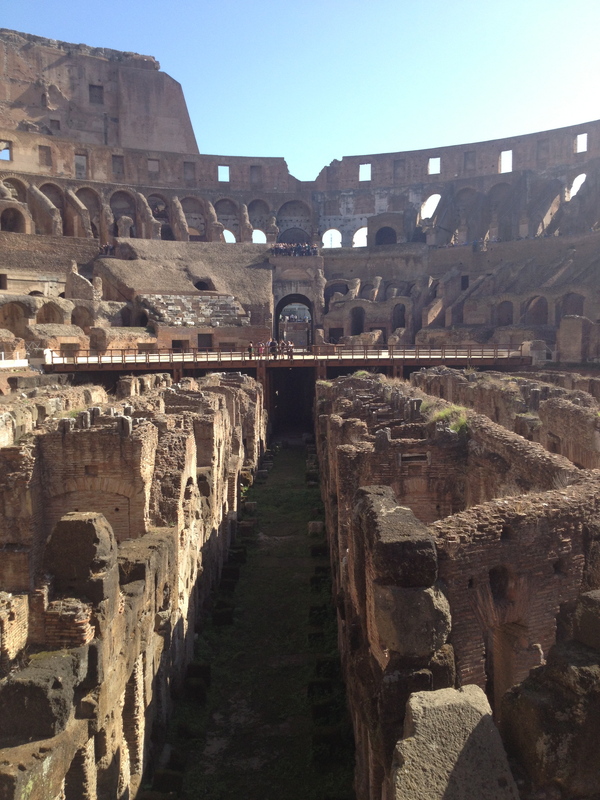 After walking leisurely around the Roman Forum we headed to the Colosseum and as I mentioned avoided the queue! The temperature was in the mid twenties but in the shade of the passages and staircases there was a cool breeze and the walls were almost cold to touch. As you enter you walk up an internal staircase and walk around the outside for about 100m before you get your first view inside. When you first see the inside bowl it is simply breathtaking. Much bigger than I though and very intimidating. I tried my best to imagine the noise and emotions of a packed crowd all feeding off the entertainment. Much like the Forum you do need to have a good idea of how it looked to truly appreciated what you where seeing. I’m sure most of us have seen the Russell Crow film, Gladiator, so picturing the epic battles in the middle of the arena wasn’t too difficult. Personally I think I easily could have stayed inside all day just admiring the structure and taking it all in. I felt I could never take enough pictures. However we had other sites to see and a pre-agreed pasta lunch. It would have been pizza but we had that the day before in Sorrento, the birth place of the Margherita. With the map in hand I planned a walking route that would take in many of the main sites. I was never good at remembering street names or directions but I have a pretty good sense of direction. I was always confident anyway; the city was built by the Romans so it must be laid out in a logical way! Our first stop was the Wedding Cake, previously pointed out by the taxi driver. 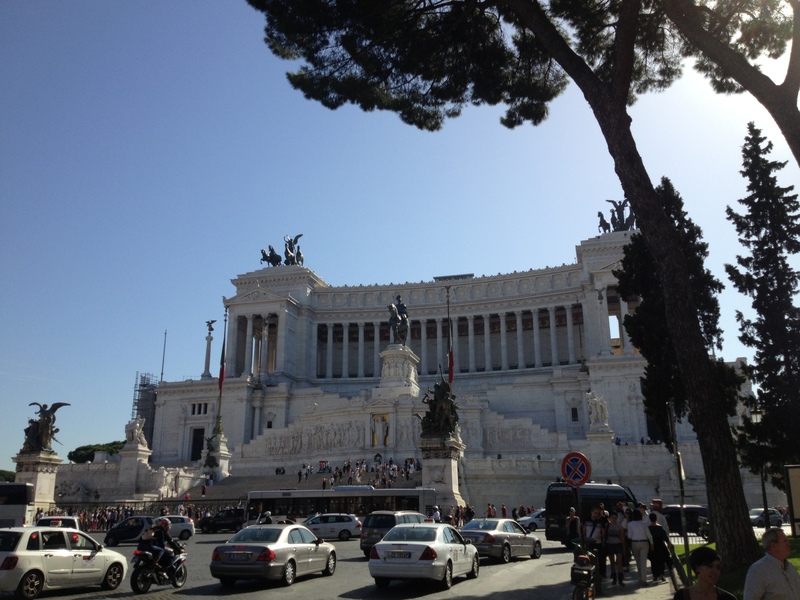 The real name for the building is The Monumento Nazionale a Vittorio Emanuele II which was built to honor Victor Emmanuel, the first king of a unified Italy. You guessed it, it’s big and white with statues on top and looks good enough to eat. It really should be called the ‘cut in half wedding cake’ but that’s clearly not as catchy. Next stop was the Piazza Navona, a former competition arena that houses many statues even one of a man wrestling a Dolphin, man’s greatest enemy. It was in this open square lined with bars, restaurants and artist. We decided this would be a great location to have lunch in the glorious sunshine. I can’t remember the name of the restaurant but it was very good and the staff were very friendly. We both enjoyed a delicious pasta dish with Italian beer and breads, they do say ‘when in Rome.’ There was an awkward moment when I misunderstood the waiter’s body language and offered him up my girlfriend for a free kiss, actually he just wanted some of her sunscreen, easy mistake. After lunch we made our way out of the Piazza Navona for a short walk to The Pantheon, a temple to honor all the gods of Ancient Rome. The building is simply stunning. The inside is a wonderful dome shape with a central opening to the sky, perfect I imagine for worshiping and remembrance. The square directly outside the Pantheon was awash with noise and activity whilst inside it was peaceful and relaxing, just like the Forum. It’s great to see tourist respecting the rules and wishes of these great attractions. 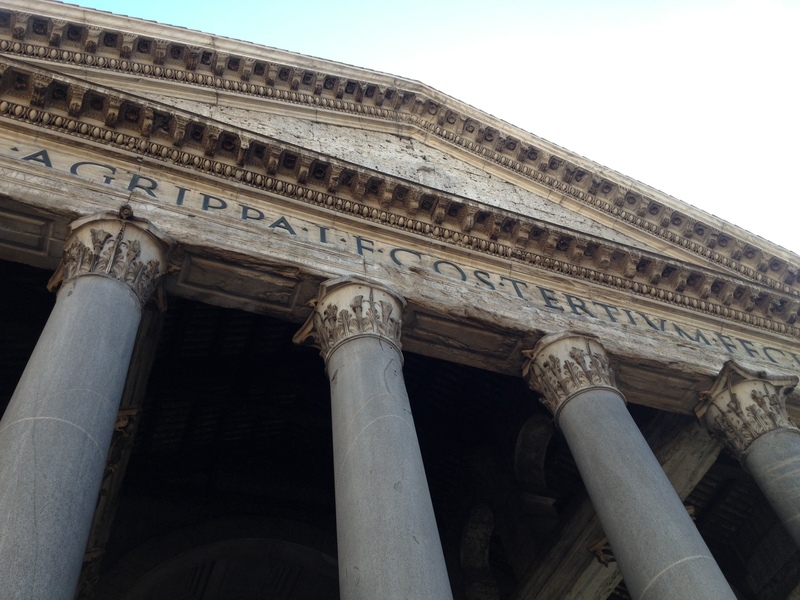 From the Pantheon we faced a good walk to the iconic Trevi Fountain. This was an ideal opportunity to explore the city on foot through the back streets and roads. All following my strict route of course! 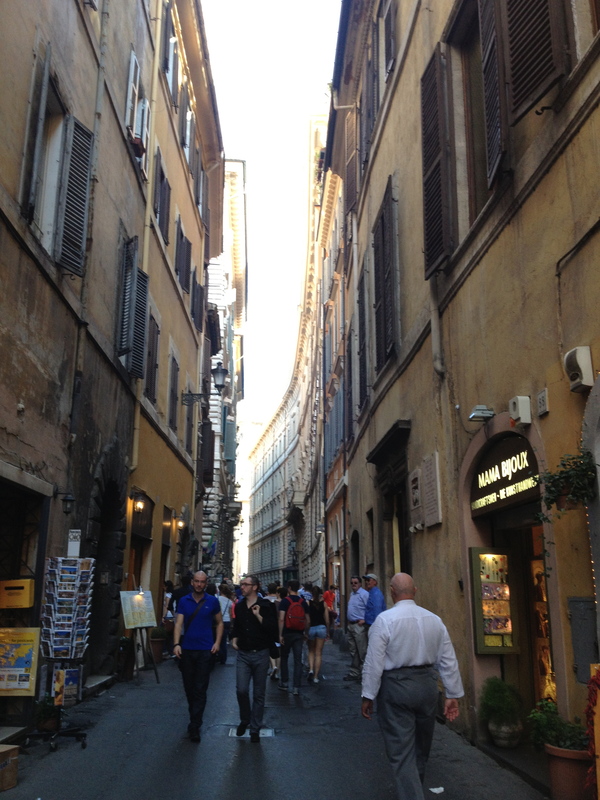 It was during this walk it first occurred to me that Rome will properly be elevated to my favorite city in the world. Everywhere we looked we saw stunning and historic architecture, painstakingly carved statues and monuments’ and countless relics to the cities colorful and world renowned influential past. It was relentless. I was expecting the tourist sites but not the consistent nature of the how the city played out in front of me. It was a good job my camera was charged. 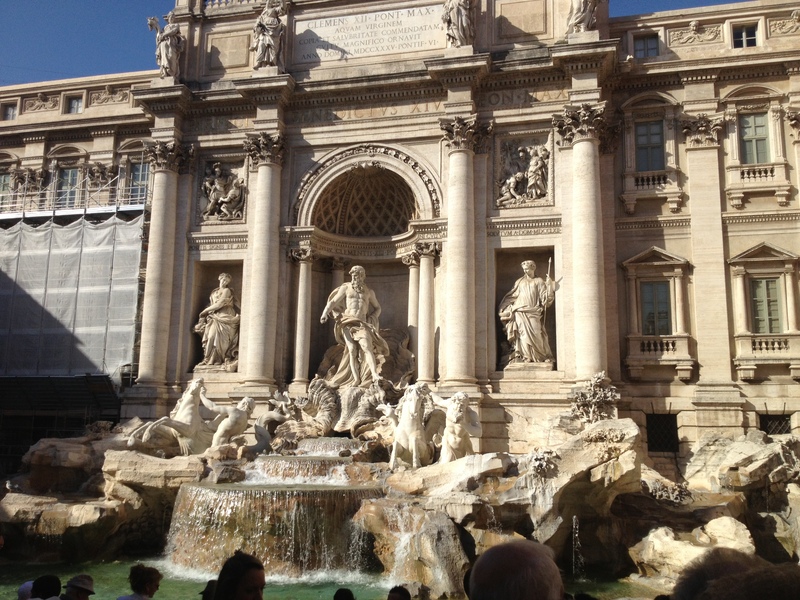 We arrived at a busy and atmospheric Trevi Fountain and had to maneuver our way to the front. The scene was perfect, couples and families all caught up in the moment. Once at the front we searched are pockets for some change, eager to make our wishes into the fountain. If the chances of the wish coming true correlated with the amount of money you threw in we won’t be getting our dream house and car! After making our wish my girlfriend decided to bestow upon me her knowledge of the correct technique of throwing money into a fountain. Apparently over your shoulder is the correct way. We didn’t go back and try again. To our next destination of the Spanish Steps we strolled along the main street in the historical centre of Rome, The Via del Corso. The main street is home to many shops, bars, cafes and restaurants. Off the main spine are countless side streets lined with shops and cafes, the locals all seemed to be engaged in heavy debate whilst they enjoyed there expreso’s and cappuccinos. One street I remember walking down seemed to only sell men’s formal shirts. We saw all the designer shops, Gucci, Louis Vuitton, Cartier, Prada and many many more. They all avoided the interests of our credits cards though. Whilst walking along one of the side streets admiring the designer and independent shops I saw my future, Daniels Hotel! Naturally it was a four star! 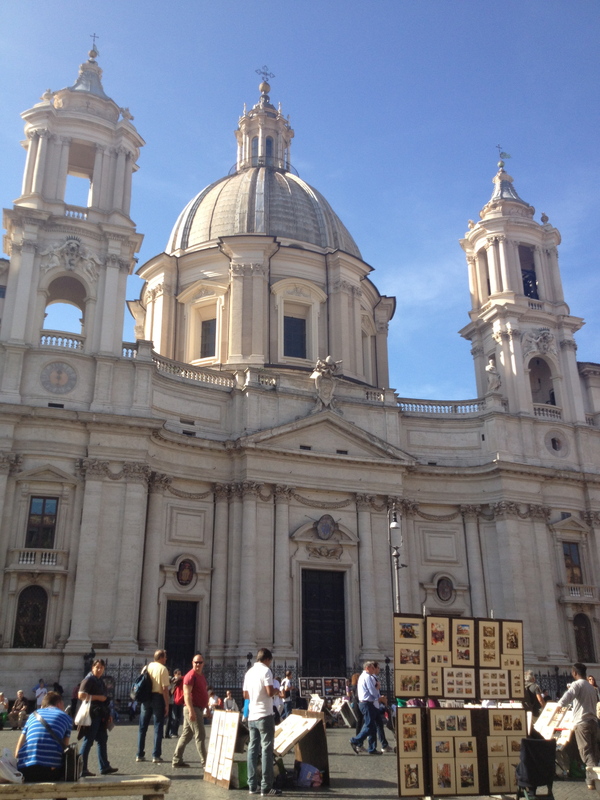 As we approached the Spanish Steps or in Italian the Scalinata della Trinità dei Monti we were greeted with the sounds of cheering, chanting and whistles. There seemed to be some sort of protest or march taking place that took control of the entire area. There was no room on the widest staircase in Europe to sit down or even stand. We were pleased to say we at least saw the famous steps although a little disappointed we could walk up them. I wasn’t aware of what they were chanting about but we were pre-warned about possible protests in the city. It was all good natured though and never seemed to be coming close to any troubles. The disappointment of not getting a picture on the Spanish Steps was soon gone as were once again awash with the vibrant shopping streets as we headed back to the Via del Corso. Once on the main strip again we followed the road as it turned from what was a busy street a rush with buses, cars and mopeds to being overrun with pedestrians. The theme of the day continued as we passed many stunning historic churches and monuments. The designer shops turned into arts and crafts and independent stores before we arrived at the People Square or the Piazza Del Popolo. 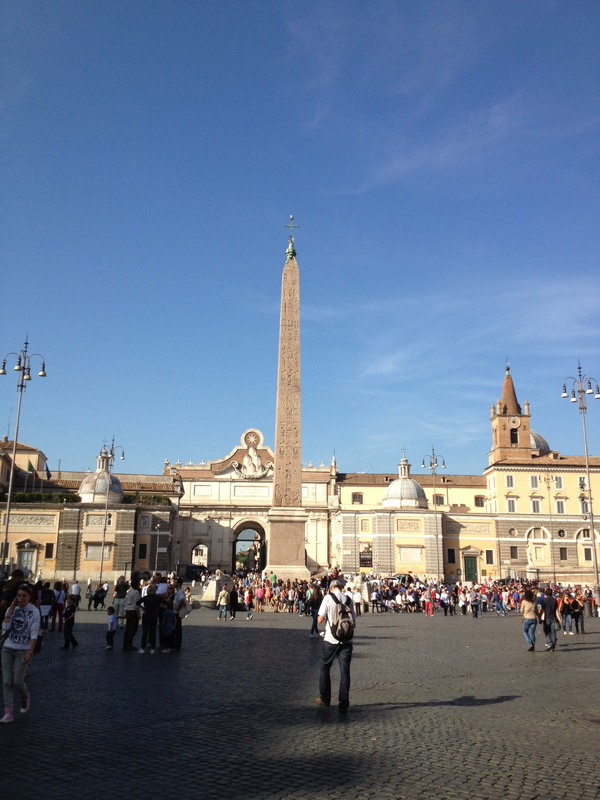 The Piazza Del Popolo was the largest square we had been to. It reminded me a little of Trafalgar Square in London with is large open area surrounded by fountains and statues honoring the greats of Rome and Italy. As you stand in the centre of the square you can see down the straight Via del Corso, just like like one of the avenues in New York and really take in the atmosphere and energy of the city. 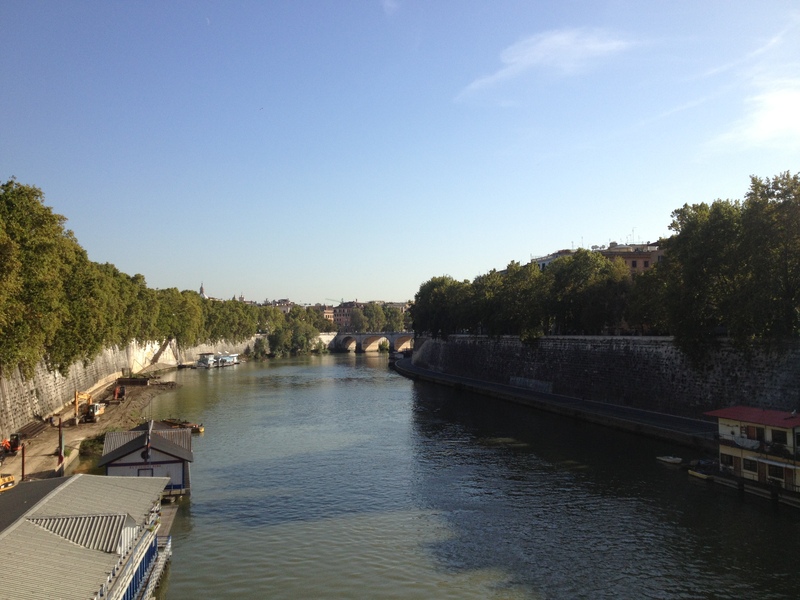 From the People Square we crossed for the first time the Tiber River, the third largest river in Italy. After crossing the river we begun heading back towards the Vacant and the Sistine Chapel. Our walk was about 25min which took us along a slightly quieter part of the city. The walk gave us amble time to reflect upon all that we had seen and witnessed. We observed the local traders and residence going about their daily routines, perhaps oblivious to what an amazing city they were in. 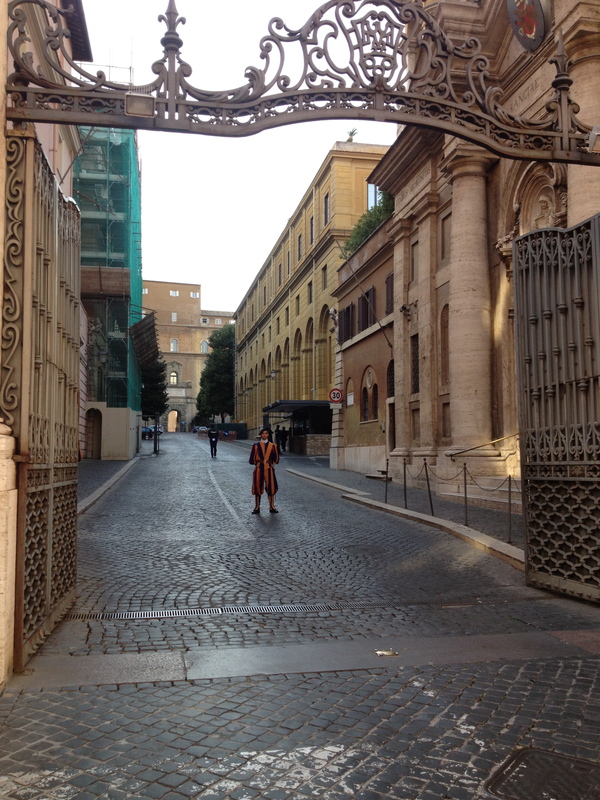 When we approached the Vacant and the Sistine Chapel we passed one of the Swiss Guards or Schweizergarde. He stood to attention perfectly still for the entire time I stared at him. A quick picture and that was that. I had achieved and seen enough to more than satisfy myself, whilst I was aware there was much much more to come back for at a later date. We found out that the next day the Pope was to canonize seven new saints in front of huge grounds. 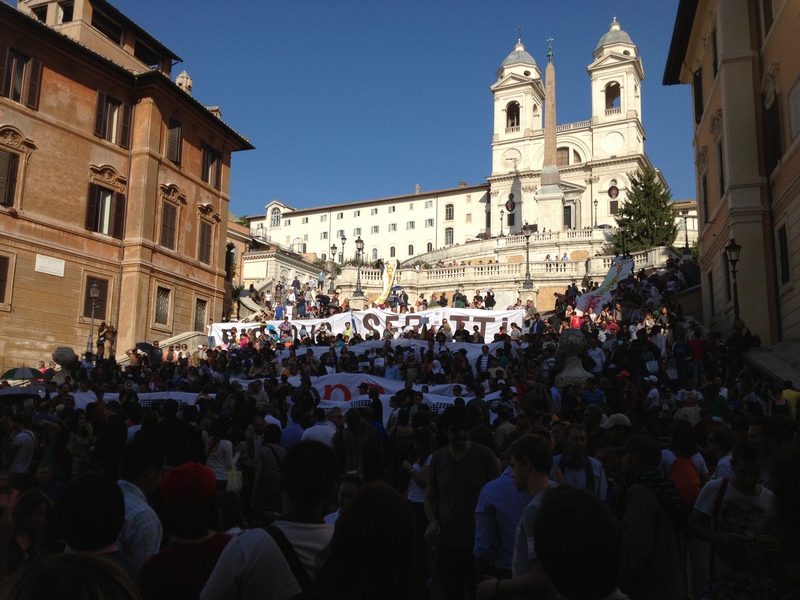 Which explained the seven giant banners hanging outside the Vatican. Truly Rome is the ‘Eternal City’. It will live in the highest regards in my memory. It’s never fair to compare cities against each other as they all offer such different characteristics to suit so many different tastes. However i’m confident when I say Rome is one of, if not the greatest city I have ever been to and I would 100% recommend it to anyone. The history architecture and culture all combine to create a city that is so much better that anything the text books and movies could ever do justice. Would you like to visit Rome on a coach holiday?